New Zealand has five native beech species, commonly known as red, black, silver, mountain and hard beech, each with a different natural geographic distribution. Of the five, red beech (Fusca fuscospora) and black beech (F. solandri) are the most readily available from nurseries, have the fastest growth rates, and hence are the best choices for landowners planning to establish a native beech plantation for timber. Beech timber properties vary between species, but all are generally straight- grained, with excellent working properties. End uses include flooring, veneer, interior joinery and furniture. Beech is particularly palatable to browsing pests – e.g. rabbits, hares, deer and goats – so these pests must be rigorously controlled and numbers kept low for as long as possible after planting. Beech is normally supplied as containerised stock: use only good quality seedlings – ensure trees are sturdy and well grown (30 cm minimum height), and that roots are moist and not pot-bound. There are significant genetic differences with beech so use eco-sourced stock if possible, i.e. use stock raised from seed collected within your region or as close to your planting site as possible. Handle seedlings carefully, keep cool and moist, and plant as soon as possible after they arrive from the nursery. Prepare grass sites by spot spraying with herbicide before planting. Control competing vegetation around each planted seedling by careful knapsack spraying (seek advice on choice of chemical). Repeat release spraying over several years with beech and other native species, as they can be initially slow to establish and will readily succumb to early competition. Seedlings in shelters may need hand- weeding. Red beech prefers deep, well-drained, fertile soils typical of lower to mid slopes and river terraces. It is generally very intolerant of unfavourable conditions, has better survival in cooler climates, and poor survival in warmer lowland regions. Black beech is tolerant of a wider range of site types, including droughty soils and low rainfall conditions. All beech species are likely to establish best if planted in partial shelter such as within canopy gaps, or with the help of a nurse species established a few years before the beech is planted, especially on exposed sites. It is possible to establish beech on open sites, and early seedling survival may be enhanced by using short (0.6m high) shelters. The more densely trees are planted, the more likely they are to grow tall and straight with good timber potential. In theory tightly spaced trees will then need relatively little pruning or intervention other than thinning. 1.5 – 2 metre spacing, then inter-planting with beech 2 – 3 years later at 3 – 4 metre spacing (1100 – 800 stems per ha). Form-pruning is recommended if the aim is to produce straight single stems suitable for milling. Form pruning involves pruning from ‘the top down’ – selecting a leading stem and removing competing leaders and steep-angled or particularly coarse branches. Often all that is required with beech is the removal of a double leader with loppers; the trees can then be left to grow for several more years without further intervention. Form pruning should be done once the trees are well-established and above the height of any competing vegetation – e.g. from around 2 metres tall. Suitable tools include normal loppers, long-handled loppers, and occasionally a pruning hand-saw. Beech will generally self-prune following canopy closure. Where trees are open-grown or have retained large branches, the best stems can be gradually clear-pruned to whatever height required. Several pruning lifts may be needed as no more than 30% of foliage should be removed at any one pruning. Clear-pruning often attracts deer wanting to rub velvet from their antlers, so control deer before they ring-bark your best newly-pruned trees. If densely planted stands are left-unthinned, the result will be a stand of tall, thin trees with good form but small-diameter stems limiting their potential for sawmilling. Thinning allows the remaining trees to grow larger diameter stems faster. An initial thinning is recommended once the canopy has closed and before the trees get too tall and thin, e.g. at 8 – 9 metres in height. Stocking should initially be reduced to around 1100 – 800 stems per hectare (around 3 – 4 metres apart); poor quality trees can be removed at this stage. A second thinning is recommended once crown competition begins again, e.g. around 6 years after the first thinning. Stocking density can be further reduced to a final crop of best stems around 500 – 600 stems per hectare (approximately 4 – 5 metres apart). A Tane’s Tree Trust survey of plantations shows that mean diameters of 50 – 60 cm can be achieved within 100 years of planting beech on a range of sites. 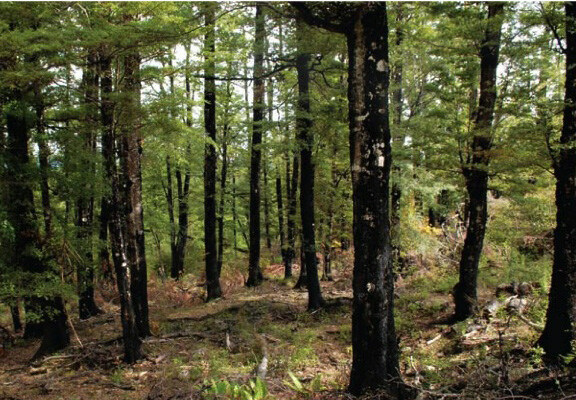 However, John and Rosie Wardle, who manage naturally regenerating black beech forest at their Woodside property in Oxford, North Canterbury, produce 45 cm diameter sawlogs over rotations averaging 50 – 55 years. The New Zealand Beeches: establishment, growth and management. Mark Smale, David Bergin and Greg Steward. NZ Indigenous Tree Bulletin No.6 (2012), Scion, Rotorua, N.Z. Woodside: a small forest managed on multiple use principles. John Wardle. NZ Farm Forestry Association (2016), Wellington, N.Z.